Hi ,I am a 44 year old lady who is considering a move to Spain away from the UK ,I have had a small domestic cleaning business which I manage myself for 17 years ,I have the keys and alarms to every household and some clients have been on my books for 17 years ,I’m a hard working ,trustworthy and very reliable person who works on a tight time scale who still gets the job done to a high standard .I am looking for cleaning work in Spain in apartments ,homes ,or offices .I can supply numerous references and have a full clean driving licence . My name is Darren I am 50 years old .I have been a self employed window cleaner in the UK now for 21 years ,within the next 12 months me and my partner will coming to Spain to settle .We will be looking at settling in Torrox region of Costa Del Sol ,can any body give any advice of what is available . Or is there any window cleaners already based there who may be looking for staff ,I have a lot experience and am extremely good at what I do . References available . Please contact me if you can help at all . Hi,I am a digital marketer looking for more clients, expert in PPC and Linkedin Ad, influencers. Etc. So if you have a company and would like me to be part of your business,,, please email me…. This sounds like a great role, I would like to hear more about what kind of selling it is? I.E walking up to people in public, a shop, online ect. .My partner and I are looking to move either to Spain at some point soon as the UK has an expensive and poor quality of life. We both work hard but there just seems to be no reward. My partner and I are both bubbly people who can talk to almost any kind of person. We speak English as our first language and we are learning Spanish currently . I’m living in La Marina Costa Blanca and looking for a general help/carer for myself initially as a temporary position. All food and accommodation included, driving essential but a car provided. There would be plenty of free time to enjoy the area and wonderful climate. Please email me back for any further information or details. I would be very interested in this – when is the start date and what is the salary please? I’m Jayne 54, from South Wales UK. I have experience as Live in Carer/Housekeeper/PA/Lady’s Maid/Chauffeur/Housekeeper. I recently visited Gran Canaria and stayed with my Son’s girlfriends Parents in Tomas Morales Las Palmas, and knew I wanted to relocate and work there. Since being back in the UK I’m so ready to make the move ASAP. If you’re still looking for an Assistant please get in touch. I can send my CV/photo which lists my Work experience. E.g. Hospital CHA, Live in Carer, Live in Companion/Lady’s Maid for a very famous VIP Entrepreneur Family Member. Pharmacy Assistant, Hospitality Pub Restaurant Manager. I have Care Certificate Level 2, DBS registered with update service. Full clean Driving Licence, Valid UK Passport. English Mother Tongue. Excellent Interpersonal/Numeracy/Literacy skills. I would be interested to hear from anyone who has potential work opportunity. Please contact me on email below. 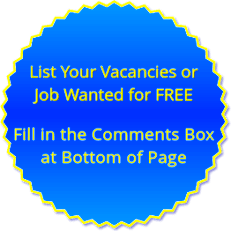 I have over thirty years experience working in the media selling advertising in magazines and newspapers and am looking for employment in the Benidorm area,but other areas will be considered. If you would like to get in touch over any positions, please email me at garyw568@gmail.com. My name is Eabha Walsh and I am an Irish student looking for a job in any part of Spain from the start of June to the end of August.I am a very hardworking girl with a bubbly personality so I would be perfect for any role in the hospitality industry. I have previous experience in both bar work and sales so would be perfectly suited for a position in either of these. I am a real people person and am eager to learn so you can put me in any role and I will adapt. As well as being fluent in English I have quite a high level of French. If you have a position open or know someone who does could you please send me an email on eabhawalsh9@gmail.com and I can send on my CV. My name is Mike and I am looking to move to Spain and work in the Andalucia region ( i.e. Velez-Malaga, Torre Del Mar, Nerja , Malaga, Torremolinos). I have over 30 years experience in the UK public sector, managing swimming and leisure facilities. Vast experience in various business disciplines but my forte is swimming pool operation and maintenance. If there are any pool maintenance opportunities, or indeed, any other opportunities which you may feel that I could be of benefit, please get in touch and I can forward a copy of my C.V for your perusal. Qualifications include NEBOSH Certificate, IOSH Managing Safely, STA pool plant operator certificate level 3, Level 3 pool plant tutor, first aid at work certificate including defibrillator use, CLAIT 1 and 2 for I.T users. Spanish studied for a few years but a little rusty, however, I expect to be able to get up to speed fairly quickly. I have a can-do attitude, am a quick learner and can turn my hand to most things. Job satisfaction is very important to me and all I expect is a fair wage for my hard work. Hello, My name is Reece and I am an experienced Assistant Manager within Hospitality. I am looking for the opportunity to work and live in Spain. I speak fluently of English being my mother tongue. I do not speak any other languages. My name is Martyna and I am from Poland. I am looking for Summer Job from June to August, especially in restaurant, bar or caffeehouse. I have already worked as witress in Germany for last 3 years during vacation. I can communicate not only in German, but also fluently in English and what is more I have started learning Spanish. I am an open-minded person, with positive attituide to the new. I am not afraid of any work, moreover I learn very fast. My adventages are also driving licence and being lifeguard. To add I can say that in May I write my Matura Exams (extended subjects Maths, Phisics and English). I decided to find work in Spain, beacuse I am sure it will be both a great experience and adventure. Even if I am only 19, I am a strong, realiable, young women, who is eager to take up new challenges in life and work. For more information, please email me on martyna.roj@gmail.com. Moving to Albir in March and looking for work in or around Albir. I have a background in various areas of office work, as well as customer service experience, office administration and I.T. competency. As part of my varied roles for Lancashire County Council, I worked closely with families and individuals, often identifying other systems of support and working with multi agency teams. I am highly computer literate; I studied computing to A-level and utilised technology as an integral part of all my career roles to date. For example, I used Microsoft Excel to maintain and analyse records of attendance and usage of social care services. I also use Microsoft Word frequently when applying for funding and grants. Hello, my name is Ivan and although of Italian origin but I living in Australia, Melbourne, and i speak English. I am a fully time served wall and floor tiling specialist and have been a tradesman for some 20 years. I cover all aspects of the trade and am looking to move to Gran Canaria for contractual work with a well established english building contractor. My Email address is zito.ivan@yahoo.com.au . My portfolio is available upon request with customer testemonials. hi, i am looking for a job in tenerife south for my sister, as we all live here. she s holding brazilian passport. she has been working in various company in india. she speaks english, spanish, Portuguese, indian. is there any possibility for her to get a job here? Hello, my name is Veronika, I´m 24 years old and I´m from Slovakia. I would love to spend whole summer in magic Barcelona working and living. Looking for job in hotels or bars. I don´t speak spanish or catalan but english fluently and I´m quick learner. If you´re interested please just send an e-mail. Hello! I graduated from college a year ago and am currently living in Madrid working as a teaching assistant. I have a degree in Spanish and am on the brink of fluency and am really interested in English/Spanish translation and interpretation. I want to move to Spain, however, I don’t want to work in the education system like I am right now. Any words on how to find sustainable translation/interpretation jobs as an American in Spain? Or jobs similar to said job? Thanks!